I’ve never tried false nails before but have seen a lot of buzz in the blogosphere about Primark’s bargain £1 stick on nails. 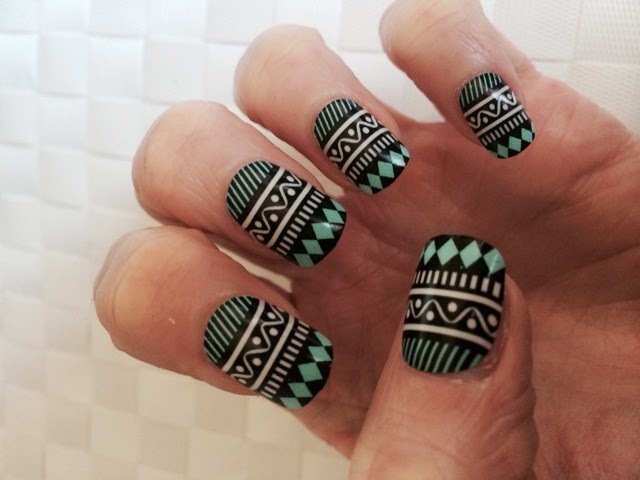 I decided I had to try them out for myself and chose these very funky turquoise and black Aztec patterned ones. The kit contains 24 nails of varying sizes and a small tube of nail glue. I have read a couple of reviews saying that the glue isn’t actually that good, and I wasn’t keen on using adhesive glue on my nails in case it messed them up (I have a problem with flaky nails at the best of times Urgh!) 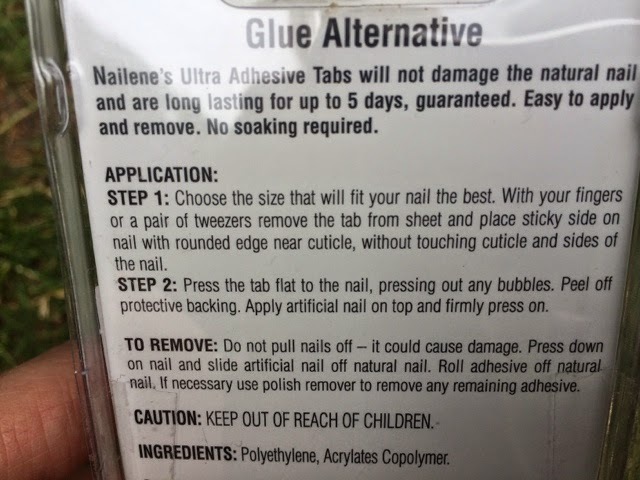 Instead I decided to purchase some Nailene Ultra Adhesive Tabs to stick the nails on as they promised that they “will not damage natural nails”. The Tabs were super simple to use– you just select the size which best fits your own nail, peel it off the backing sheet and stick it firm to your nail. I then chose the sized nail which looked closest fit, peeled off the thin plastic layer on the top of the sticky tab, and pressed the nail in place. Simples! I did find that for my second hand it was easier to choose the correct sized nails and lay them out ready before sticking on the tabs, as a couple of times I found I stuck the wrong sized nail on and had to prise it off and start again with a new sticky Tab and nail. The nails were a little bit longer than I’d have liked, and I found it pretty hard to do some things such as unclasp my necklace or use my iPhone! It would be great to see some shorter versions from Primark in the future. The nails were easy to remove – you just press down and slide them forward, and the majority of the sticky Tab comes off with the falsie too. I then used warm water to rub any remains off. 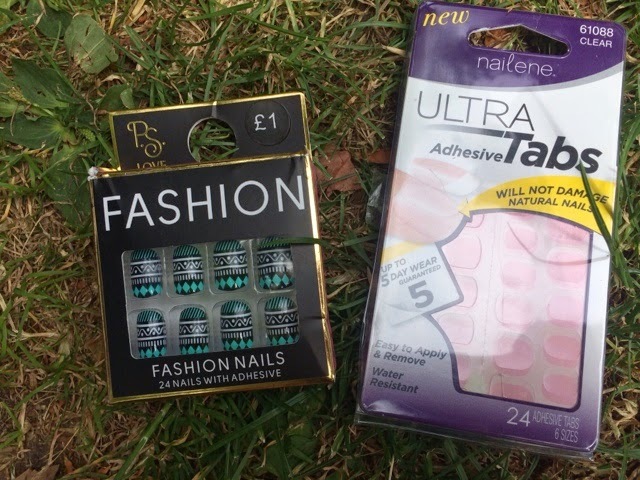 I found the Nailene Ultra Adhesive Tabs pretty easy to use (although a little bit fiddly when doing my second hand when the first one was already fake nailed up!) I did find however that they moved around quite a lot which was at best annoying and at worst, painful! They didn’t always feel very secure and I was quite worried they’d suddenly ping off (and one actually did in the middle of step aerobics when I was rotating my step haha! #awkward!) This also meant that when pulling up my tights the nails pushed back into my cuticles which hurt quite a lot! The Tabs are quite fat and I found that when tying my hair up strands often got caught in the gap at the base of the nail, which did lead to a couple more nails pinging off prematurely! Despite the few negative aspects I highlighted above I would use the Nailene Ultra Adhesive Tabs again as they did protect my natural nail. The packaging says they give “Up to 5 day wear guaranteed” but I would probably only use them for a night or day out when I knew I wouldn’t need to put too much stress on them to avoid any embarrassing nails flying through the air incidents! I was really impressed with the Primark nails, for £1 there a great inexpensive way to jazz up an outfit and experiment with some fun nail art. 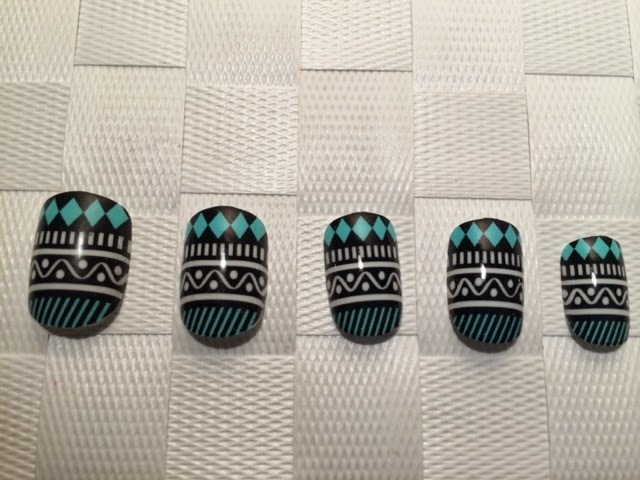 I’ve seen that as well as a big range of patterns they now also do simple French nail designs too. Now they just need to make some shorter ones and I’ll be a happy Pickle! 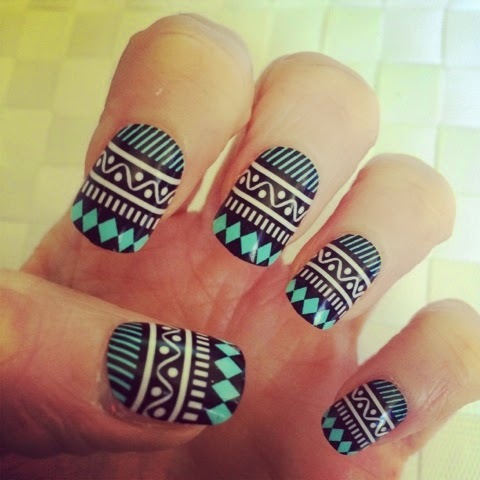 What fake nails do you like to use? What do you use to stick them on?